When packing to head out on the trail we look to cut as much weight as possible. But we all have those little things we HAVE to take with us. Well the extra weight I throw in my pack is photography equipment. So for my reviews on theBREAKDOWN I would like to focus primarily on the gear that I use to capture the shot. There are plenty of amateur photographers out there (including myself) wanting to get equipment that helps expand the possibilities of their camera. Nature photography doesn’t require too much equipment to get the job done, but there are things that help ensure you get what you’re looking for, without having to enhance your pictures later. I will show you products that have made my life easier, and some that haven’t, with a goal to save you money. If you’re anything like me, you don’t have extra money to waste on products that don’t work! 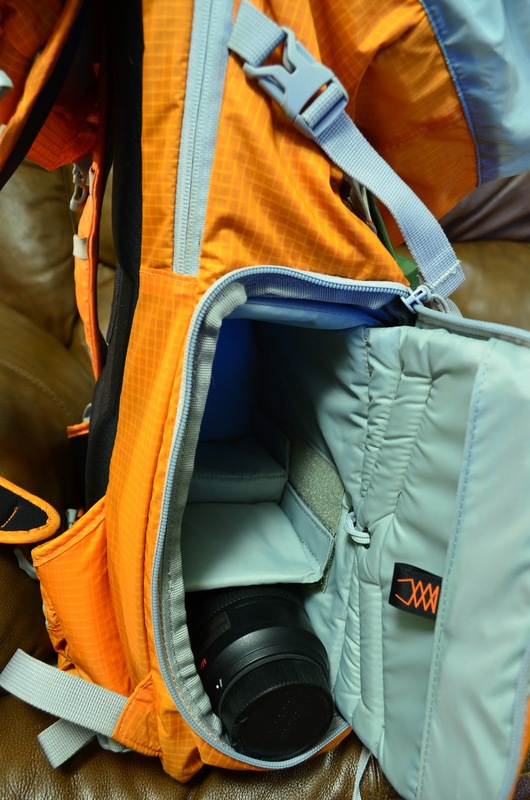 So for my first photo gear review, the Lowepro Photo Sport 200 AW is my product of choice! This camera pack has allowed me to take my camera anywhere I please. It’s a day pack and I wouldn’t take it on an extended trip, but for everyday use it is superb. It was designed around the adventurous photographer so it fits my shooting style perfectly. I went looking for a new camera bag 8 months ago and I wanted to buy something that had absolutely everything I was looking for. I’ve spent too much money on bags that didn’t meet my expectations and this time I wasn’t afraid to spend the money to get it right the first time. After weeks of research I decided on this pack. It didn’t meet every requirement on my checklist, but it was the best I could find. The first thing I noticed was the strap design. It may as well be designed by any full-size pack company. Padded perfectly, with waist and chest straps to hold the pack nice and tight while on the trail. Another noteworthy design akin to the full-size packs is the padded back support that helps ventilate and reduce sweating, which equals more comfort and more smiles for your trip. 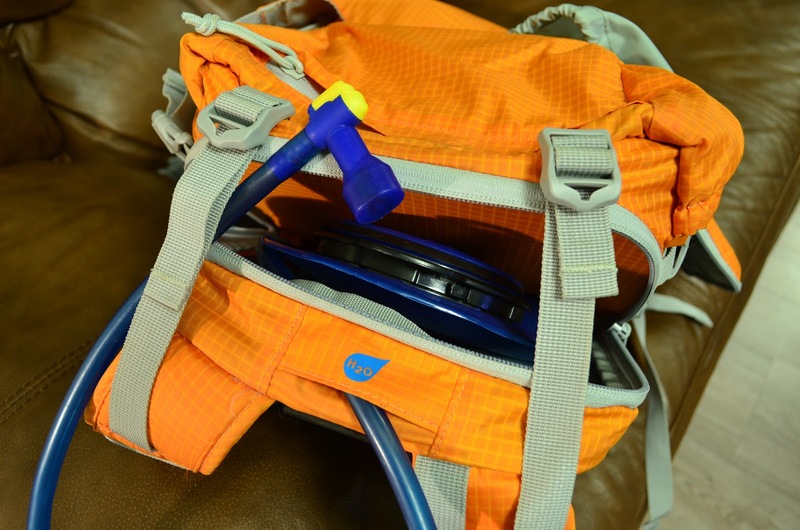 Then came the coolest feature to set this apart as an active pack, the hydration pocket that holds a 2 liter water bladder. 2 liters goes a long way in keeping you going throughout the day, and it’s the key feature that sold me on this pack. I used to carry a Camelbak and a camera bag over my shoulder, so putting the two together solves a huge issue of mine, girth. Next was the camera storage. The side access, ultra-cinch chamber holds my camera body, along with a 10-24mm and 70-300mm lens. 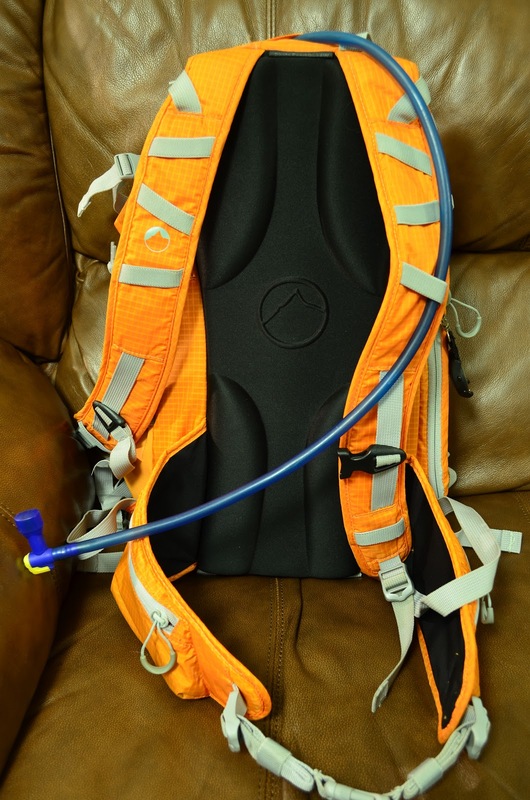 It’s thick padding guarantees that any condensation from my hydration bladder will never reach my camera, and the cinch system provides protection from all the bouncing around you’ll have on the trail. The other storage is great. 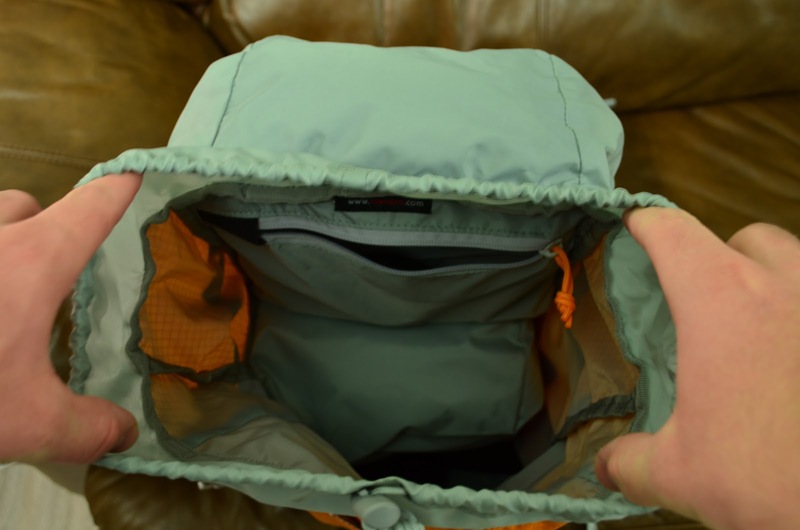 The upper compartment is wonderful for holding some lunch and a jacket, plus it has a small zipper compartment that offers a secure spot to haul memory cards. The top pocket is the perfect size for a small notepad and sunglass storage. Then there is a front sleeve and a side sleeve to haul more gear. 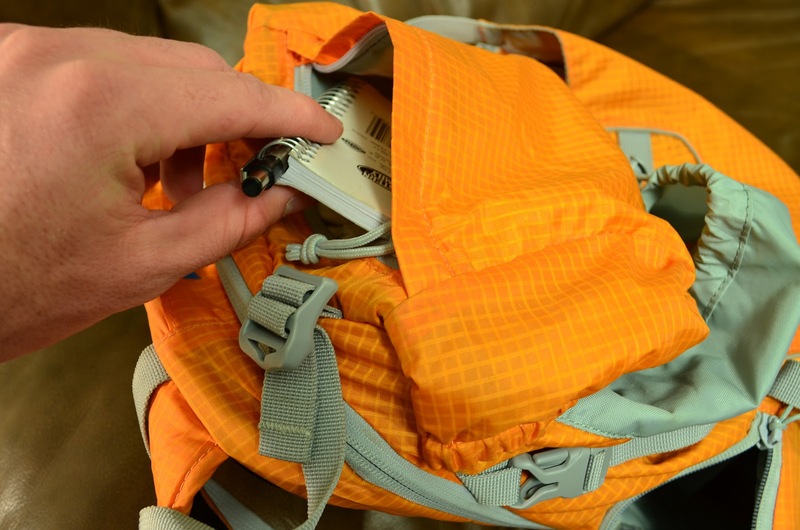 By now you should be able to hold everything you need, but there are also two pockets on the waist belt to hold little items, I use one to carry a wireless remote and the other for a pocket knife, which always comes in handy! The exterior has two sets of cinch straps to hold even more. They are perfect for tripods or a roll of rope if you’re on technical trail. This rounds out the pack, giving you more space than usually needed. The one thing I don’t like about the photo sport is the size of the camera compartment, I wish I could fit one more lens inside. I just throw an extra lens in the upper compartment and it works fine, I’ve never worried about the lens, but it would still be cool to fit in it the padded storage. Overall I carry a Nikon D7000 body, a 10-24mm lens, an 18-55mm lens and a 70-300mm lens. I also have a lens cleaning kit, a graduated neutral density filter, an off camera flash, a 52mm polarizing filter, a small notepad, a USB cable, multiple memory cards, a wireless remote, and my tripod. Plus food, Kleenex, sunglasses, a bandana, a pocket knife and a lighter. It’s plenty of stuff to get any job done! One more feature: The rain cover works as it should, covering the whole pack and keeping all my stuff nice and dry during those unexpected downpours, because a good rain can mess up your day quickly if you aren’t prepared! Another great reason to buy this pack is that Lowepro is a wonderful company that stands behind their products. 2 weeks after buying my pack I had a malfunction in one of the straps. I called the store that sold me the pack and they told me I would have to go through Lowepro to take care of the problem. I was afraid it would be a huge hassle, but I emailed them and within 10 minutes received a response telling me what I needed to do in order to get a new pack. It was a hassle free process and I was impressed how quickly they helped me out. I would recommend buying any Lowepro product based on this fact alone. They are a good company! It’s definitely my favorite pack I’ve owned, it’s just about perfect for what I need and I’ve loved having it. 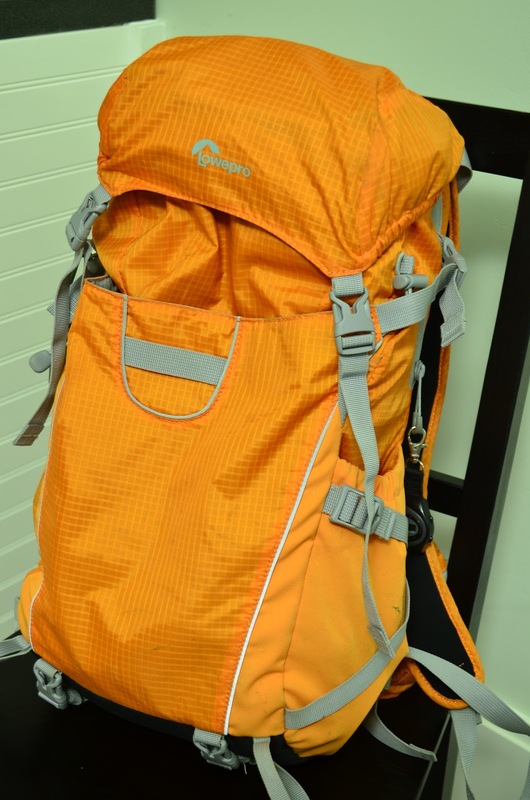 It is somewhat pricey ($199.99 msrp) but trust me, the pack does what you’ll need. An amateur will spend a little more than they maybe feel they can afford for a hobby, but in the long run you won’t have to upgrade for years. So spend the money now and you won’t have to spend later!